After a bruising match-up between two heavyweights, I think everyone’s ready to get back to a bit of Lent Madness “normalcy.” Yesterday’s match-up had emotions running high as Martin Luther King, Jr. took on Martin Luther. This was like Kentucky squaring off against Duke in the first round or Borg taking on McEnroe in a Wimbledon qualifier. It wasn’t fair; it was mean; it was diabolical; it was Lent Madness. In the end, Martin Luther King advanced in heavy voting 55% to 45% sending his namesake to the heavenly showers. We were happy to welcome many of our Lutheran brothers and sisters to Lent Madness and we encourage you to stick around! Who knows? Maybe we’ll have an Oktoberfest-themed play-in round next year. Today we have a 7th-century Celtic saint taking on the first woman ever ordained in the Anglican communion. The SEC is paying special attention to issues of voter irregularity in case supporters of “Hanging Chad” of Lichfield try any funny business. We expect heavy, if controversial, voting from Broward County, Florida. In case you missed yesterday’s edition of Monday Madness, Tim and Scott reveal some interesting news about the timing of the pope’s retirement and announce a rare joint appearance coming up later this week. Around the time he became Abbot of Lastingham, the Bishop of Northumbria died, setting in play a strange series of events in which Chad would ultimately become intricately involved. Oswiu, the King of Northumbria, chose Wilfrid, a Northumbrian noble, to become Bishop. However, due to an outbreak of the plague in England, Wilfrid found himself unable to find the three bishops necessary to ordain him; undeterred, he sailed for France to seek ordination. The Venerable Bede notes that during Wilfrid’s absence, the King of Northumbria became impatient with the vacancy and decided to take further action. Impressed by Chad’s holiness, the King appointed him to take Wilfrid’s place as Bishop of Northumbria. Chad encountered the same problems in tracking down bishops as Wilfrid did; ultimately, he traveled to Wessex, where he was irregularly ordained bishop by two British and one Welsh bishop – none of whom were recognized by Rome. Bede recounts that Chad diligently set himself to the work of administering his see. By the time Wilfrid returned from France, the new Archbishop of Canterbury, Theodore of Tarsus, denied the legitimacy of Chad’s appointment, and announced his intention to install Wilfrid to Chad’s see. Theodore instructed Chad to step down from his position as Bishop of Northumbria. In an act of profound humility and obedience, Chad did so without hesitation or reserve, and he returned to his abbacy at Lastingham. Later that same year, the King of Mercia requested a Bishop. Remembering Chad’s example of humility and holiness, Archbishop Theodore recalled Chad from his retirement to Lastingham, and had him re-ordained as a bishop. Chad’s humility was most acutely seen when he refused to use a horse to travel his diocese, preferring to follow the example of the apostles by walking. Archbishop Theodore ultimately ordered Chad to use a horse for his longer travels, and Bede recounts that the Archbishop once went so far as to lift Chad into the saddle on one occasion. Almighty God, for the peace of the Church your servant Chad relinquished cheerfully the honors that had been thrust upon him, only to be rewarded with equal responsibility: Keep us, we pray, from thinking of ourselves more highly than we ought to think, and ready at all times to step aside for others, that the cause of Christ may be advanced; through him who lives and reigns with you and the Holy Spirit, one God, now and for ever. Amen. Born on May 5, 1907, in Hong Kong, she was named Li Tim-Oi by her father, which means “much beloved daughter.” She took the name Florence when she was baptized as a student, because she came to respect the example of Florence Nightingale so much. From the time she was born, Florence Li Tim-Oi was encouraged to believe and to live into her essential, God-given worth. At that time, women were allowed to be ordained ‘deaconesses,’ and it was at one of these ordinations in 1931 that Florence first felt a call to the ordained ministry herself. She pursued a theological degree in Canton, and was ordained to the diaconate in 1941. Upon her ordination, the local bishop assigned her to a congregation all her own in Macau. Macau was, at the time, a Portuguese colony that was filling up with Chinese refugees who were fleeing from the war in the Pacific. Florence had her hands full, but she was on it. She fed those who needed food, started a huge Sunday school for the kids, educational opportunities for the adults, and ran the congregation by herself. This was great news for the congregation, but soon presented an eccesiological conundrum for the bishop. Because of the war, no priest could get to Macau to celebrate the Eucharist. So, after pondering this puzzle for a bit, and flying over to the US to talk this over with Reinhold Niebuhr, the local bishop, Ronald Hall, came to a conclusion, and in January, 1944, Florence became the first woman ordained to the priesthood in the Anglican Communion. She literally had to sneak through the Japanese army’s encampment to attend her own ordination. 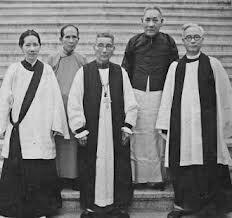 She served as a priest in Macau until the war ended in 1946, and word got around in the Communion about what had happened. Consternation ensued. To keep the peace in Dodge/Lambeth, Florence relinquished her license to officiate, but she never, ever renounced her vows. For the next thirty years, she lived as a Christian priest in secret, living the gospel in silent deeds. She went to help a parish near the Vietnam border, as a lay minister. She started a large maternity home trying to ensure the survival of infant girls. When the Communist takeover hit China, she was under constant suspicion by the authorities. At one point, the Red Guards made her cut up her own vestments with scissors. She was removed from her parish and made to work on a chicken farm. She was sent to re-education camps and brainwashed. Finally, she resumed ordained parish ministry in 1981 when she moved to Toronto. She died in 1992, but not before she saw women accepted as priests in other corners of the communion. Gracious God, we thank you for calling Florence Li Tim-Oi, much beloved daughter, to be the first woman to exercise the office of priest in our Communion: by the grace of your Spirit, inspire us to follow her example, serving your people with patience and happiness all our days, and witnessing in every circumstance to our Savior Jesus Christ, who lives and reigns with you and the same Spirit, one God, now and forever. Amen. 144 Comments to "Chad of Lichfield vs. Florence Li-Tim Oi"
Dear Maple Anglican, the Archbishops’ update videos are a great addition to Lent Madness–thank you! This one was hard for me because I have long admired both of them so much. No trouble for me on this one. FloLiOi – nuthin’ but net. Amazing story of perseverance, dedication to her calling, to God and to others. Never knew her before. Shame on me. I served as deacon to a wonderful woman when she was in a nursing home and her name, by marriage was Edsall. Her daughter still lives in Nashville. Got any Nashville kin? I still miss my friend so much. Aleathia, I don’t believe we have any relatives in Nashville. Divided loyalties today. Chad is the patron of my diocese, but I actually knew Li Tim-Oi. Florence Li Tim-Oi it is. The Day of the Irregular Ordinations! This is the true diabolical match-up. Two humble servants who voluntarily stepped aside to serve God and people. The only reason I went with the modern over the historic was performing ministry under hostile civil conditions. This was an easy one for me, Florence was amazing and gets my vote. I must admit, though, I do like Chad. I had the privilege to be pastor to Amelia Hill, another deaconess who in practice became the priest of Allakaket, AK though not so ordained officially. For thirty years she was the postmistress, nurse, teacher, catechist and general savior of the village. When I celebrated Easter there a few years ago, the village elders told me many. many stories of her saintly ministry. I vote for Florence with pure joy in honor of “The Angel of Allakaket”. Beautiful witness, Geroge! Thank you for this story! Thank you for sharing that wonderful story of Amelia Hill. You make me wonder how many others there might be. Florence’s is an amazing story. I remember much of it from the last time she was in Lent MAdness…. George, thank you for sharing a story about the unsung saints among us. What an amazing person Amelia must have been! Umm, I’m not a Welsh speaker, but I can muddle my way thru the pronunciation anyway, and ‘Ceadda’ and ‘Cedd’ come out just about the same (Keth or Kathe, with a voiced th). So is this a case of naming the sons the same in case one or both dies in infancy? I suppose life in WWII Phillipines vs plague-ridden Europe isn’t too terribly different–death all over the place either way, and agod’s people a light in the darkness. This is an uneven match up . . . Fond as I am of the Celtic saints, and as much as I enjoyed my visit to Lichfield in recent years, there’s no way I would vote against Li Tim Oi! I had to write a major church history paper during my own irregular preparation for ordination, and I chose to write about her. She holds a place in my heart that no Celt could ever take. Go Flo! I’m giving a mercy vote for the underdog today. Poor old Chad. Good for you! Poor Chad indeed. But Florence must win this one. I would also like to register a side vote for Bp. Ronald Hall, for being a good listener when God called him to do the “impossible” (still, astonishingly, in some circles!) and ordain a woman priest. Easy for me today. Florence Li-Tim Oi – what an amazing story and witness. What an example of living into God’s call to serve in ways unexpected, unplanned, but always present to God’s people. Li Tim Oi! I remember seeing her greet +Barbara Harris at her consecration. My bloodlines are Celtic on my mother’s side. My theology is more Celtic that Western Catholic I think. My vote goes to Florence who suffered such misery and prejudice in the faithful performance of her ministry. I hope that my EDS sisters and brothers rush out to vote for her along with all of the Lent Madness voters. Our morning prayer group honors any Saint, whose day falls on Thursday. We recently celebrated Florence Li-Tim Oi. What a great story! My vote must go to her. Florence lived through a difficult and tumultuous period of Chinese history and was able not only to keep her faith but also to shine in her ministry. May all women look to her as an example of strength and courage to do the right thing! I agree, this one was much easier than Monday’s battle. Florence will be a “machine” in this one. Flo gets all my votes today! Had to vote for the beloved daughter! My grandmother was named Florence Nightingale. I so admire the work done by the first Florence that it was a forgone conclusion that Florence Li-Tim Oi would get my vote. What an example of faith and stamina for the journey Florence presents us with. Gotta ‘go with the Flo’! “Consternation ensued.” – a magnificent bit of irony that. God says “..see, I am doing something new…” and we can count on a “loyal” opposition to immediately counter with “whoa, not so fast there Creator dude!” Today’s is a battle of the humbly obedient – thanks to this match-up I learned something new and inspiring. Peace to all. I also caught that magnificent irony, and I think I shall use the euphemism “consternation ensued” any time from now on when all hell breaks loose. Yes, “consternation ensued” may be one of the highlights of Lent Madness 2013 — I too plan to use the expression! I’m always torn between the past and the present in these match ups and usually I go with the more contemporary. Why not this time, especially when Florence Li-TimOi exemplifies living sainthood? I guess because this morning I see Chad as a moving example of learning, faith, humility–living out through his life Christ’s in the world–to the point of walking to his consecration because that’s what Jesus would do. His model must have inspired others to follow or at least to contemplate how they lived their own lives, and thus insured the growth and survival of not just the church but the faith and model. Where would we be without him? You verbalized what I was feeling. Both showed remarkable dedication and humility. Both stepped aside when asked but continued to be engaged–not an easy task. While I too have voted for more recent examples, I believe the timing of Chad’s efforts may have provided guidance or inspiration for those who followed. So I am going with Chad, the trendsetter. Much as I admire Florence, here is another case of “it’s too soon”. There are many saints to choose from who have been in heaven longer than 50 years. Fifty years out gives a better filter. How about this criteria for our present time: Link eligibility to the history of color photography. If it is possible for a color photograph of the person to exist, it’s too soon to put him/her up for consideration. Also notice previous posts. People have been posting that they knew her personally. Is that bias? or what? Yes, it is Lent Madness, but it isn’t playing fair. More or less what she said! Although they broke it in this case and a few others, the SCLM’s usual standard for entry into the Calendar is dead for 50 years — and I think it a good one, and one worth keeping for LM. Florence is not the first of this year’s contenders who was known personally by voters. Also, prophets don’t necessarily fare better among those who actually know them. In any case, Lent Madness not about fairness or sanity. Our choices come from a three-pillared foundation of biographies, whim, and potential tscotchkes. We pretend to use our heads and logic and fairness and what have you, but in truth each vote is a warm fuzzy to someone special to to the voter. They are all of them Saints of God, all worthy and wonderful. As I’ve said before, everybody wins. Today, in my case, I am happy to have met both saints for the first time, and equally happy to cast a vote for Florence. Go ahead and vote your heart. It feels good. More rules? Nooooo! “The SEC decides” — that’s good enough for me! I embrace the belief that we are both saints and sinners. So I support the “fewer rules” approach to identifying saints for inclusion in Lent Madness. Didn’t Jesus say that the prophet is never recognized by his hometown? If so, what does it mean when the prophet is recognized as such by his/her contemporaries? I agree also with Peg, in that most votes end up being based on which story moves the voter more, emotionally, not intellectually. Without passion, faith is merely discipline. Voting from the heart is just as valid as voting from head. thinking of her position in the church. I feel bad for Chad. I really like him, too. If only these choices were easier! As a deacon of lo, these 23 years. I honor Sister Florence with my vote. In viewing the ordination of Barbara Harris via a gift of a videotape, I too saw this noble priest. Also, anybody who would have to be lifted on a horse to keep him from walking must have bats in his belfry. I force myself to walk for health reasons as I hate, hate, hate walking. I do believe God made Chevies so I don’t have to walk…..OK, GMAC did before Detroit self-destructed. Florence Li-Tim Oi for me. No contest. Not much of a challenge for this RN! Go Florence! And the crowd goes wild: Flo-rence! Flo-rence! Flo-rence! But I did enjoy reading Chad’s bio. Loved learning about Chad. But Florence gets my vote, No contest! Florence led the way — she gets my vote! ” From the time she was born, Florence Li Tim-Oi was encouraged to believe and to live into her essential, God-given worth.” Imagine what the world would be like if all children were to be treated with such love and respect – no matter what age they are. Both great stories of God using what’s available to minister to the people. But Florence gets the edge, in large because of the astonishing period of history she lived through. Go Flo! Her’s was a ministry of perseverance and patience that was filled with the Holy Spirit. Thanks for a great story I was not previously aware of! Gotta go with Florence Li Tim-OI. Her story is inspirational, focused, and Christ centered. I voted for Chad, because he’s way behind. And I’d vote for Florence if their situations were reversed. Happy to see either of them head to the next round; wonderful witnesses, both. I really love that photo, too…. Poor Chad is not doing well in the match up. But remember Lichfield, England inspired the development of Litchfield, Conn. under the auspices of King George II from whom I have some land assigned. Of course I no longer have it since we became independent – such is the price of independence – the requirement that you share. How does the Episcopal church decide who a saint is? The Episcopal Church has a different process for deciding who gets a feast day than the Roman Catholic Church does. Episcopalians believe we are all saints, by virtue of our baptism, but that some people are especially good examples of a life lived following the example of Christ. So every three years, at our General Convention, people can submit someone for special recognition on our calendar and Convention votes on whether this person merits churchwide recognition. Thank you Mother Florence! Oh, Reinhold, you were more of a feminist than you even knew….so thank you Ursula Neibuhr, too. Florence Li Tim-Oi, my beloved sister in Christ. You heard your name called. I now have a new patron saint! Thank you. Once again I go with the under….priest! The connection to Lindisfare and the double ordination turned me to Chad. How could I not vote for the saint who began homes for infant girls in China? Both of my girls were found abandoned in China, now living happy lives in the U.S. with their forever family. Poor Chad! I would vote 1000 times if I could get away with it. If only there were not the commandment “Thou shalt not steal(the election)’. How could this humble saint be faring so poorly? It’s time to let some of these martyred women fight it out amongst themselves and not deliver a knock out punch some of the quieter, obedient males. The world would probably be better off with more obedient males… Despite my feminist nature Chad is the one! After all, who do you think blessed him with choirs of angels, uncreated light in the bottom of the well where he would go to pray, and a week’s warning that he was to die? I had to go with Flo! I am so grateful for all the women who went before me to make my ordination to the priesthood possible. Ditto what Gwin said. Florence! Florence! WOW!! Total Recall!! Such a pairing is amazing … but had to vote for Tim-Oi, who I have championed since she was first added to the Calendar of Saints’! The story of Florence reminds me a little of that saying about Ginger Rogers, that she did everything that Fred Astaire did, but in high heels and backwards. So it has been for women in the church for centuries. I’m please to vote for a woman who finally got to lead, officially. I confess I did not even bother to read about the good Florence, knowing that I would probably be persuaded to vote for her. As soon as I learned that Chad demanded the right to WALK humbly with his God, I knew he was my man. I raced down to the vote button. I had to vote for Flo! Sorry Chad! I had to vote for Chad because I was ordained to the priesthood on his feast day–in Florida, ironically. Going with Chad because he is so far behind, and because I have family group in Lichfield. Both showed humility, but Li Tim-Oi continued to answer her calling to ministry whether it was recognized or not. Very admirable. Chad, after all, was still a leader in the church even after he had to give up the bishopric. I was happy to learn about both! Although I am married to a Chad, I had to go with Florence– what perseverance as a Chinese woman in the face of a dominant patriarchal social structure, a horrible war and its aftermath. Had to go with Florence. She ministered to her people during the Second World War . Not enough is made of the part of her ministry. Florence’s story, with which I wasn’t familiar (and thanks be to God with an assist to the Supremes for the many times I’m able to say that during Lent Madness), is truly moving, touching, inspiring, and plain holy. But so is Chad’s, under the dust of 940 years. 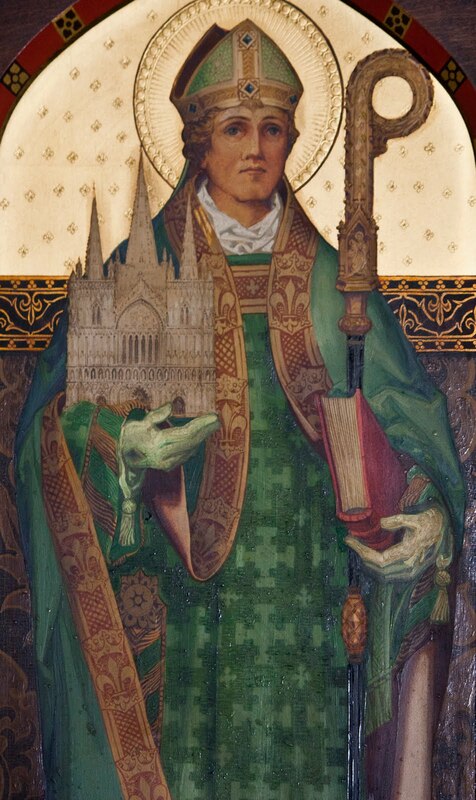 To walk where he walked (and, it seems, rode under duress) is to gain a sense of how much he did to build and shape the Church in England, and how much the Church OF England, and through it the churches of the Anglican Communion including our own, owe to his witness. His diocese of Mercia was large, unstable and, as I understand it, far from fully Christian: the Venerable Bede is said to have written in a letter that “Mercia came to the faith, and Essex was recovered for it,” by Chad and his brother Cedd. What comes to our minds when we envisage a bishop making the rounds of a diocese is far from the reality of Chad’s ministry: the work was largely if not primarily missionary and by its nature dangerous. Supporters of both Florence and Chad may be interested in viewing the reassuringly solid Cathedral of St. Mary and St. Chad in Lichfield, the religious heart of Mercia, at http://www.bing.com/images/search?q=Lichfield+Cathedral&FORM=RESTAB . 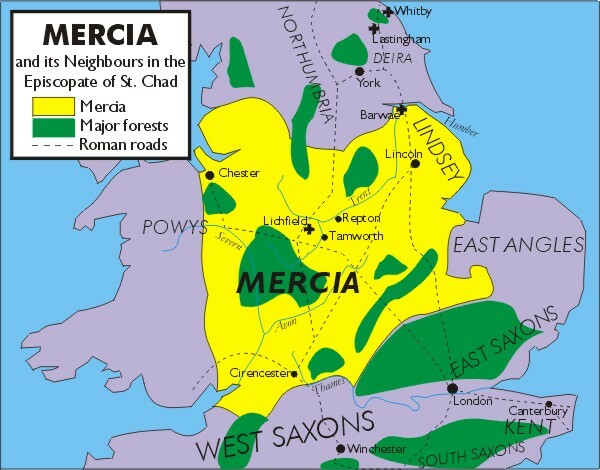 A map of 7th-century Mercia is at http://upload.wikimedia.org/wikipedia/en/2/2f/Mercia_in_time_of_Chad.jpg . This may be my easiest vote except my votes against some of the possibly-fictional saints. When I became a Christian one of the main reasons I chose the Episcopal Church was its full inclusion of women at all levels of ministry, a value instilled in my by my non-religious mother. I was baptized and confirmed by women, and currently attend the church that ordained Jackie Means. Florence Li Tim-Oi was one of those who paved the way. Given his history of renouncing privilege and serving with humility, Chad, I am sure, understands. An intriguing pairing. Chad is another important white guy. Florence Li Tim-Oi was a gentle groundbreaker, whose work was compelled by a need and mission to serve. She gets my vote. I like Chad and know what he did was important. But Florence helped open doors for women. A small step for Florence, perhaps, but a big step for humankind. Given the current results, should we call the match now so we don’t leave Chad hanging? Well, thank heavens that the Rt. Rev. Mr. Hall did not succumb to the idea of a “deacon’s Mass.” I’d give him a golden halo too! I must got with the “much beloved daughter” in honor of the Korean sister my mother and stepfather adopted 25 years ago … I do, however, admire anyone who so gently steps aside when asked as Chad did. But my life is tangled in a different story and so Florence gets my vote! I did not know either of these saints. Now I know a bit about both. It was an easy vote for Flo today because of my RN experience and because I have been Sr. Warden of a vacant parish and have a clue about running a church with no clergy. GO FLO! I knew little of Chad and nothing about Florence. Thanks to Lent madness, now I know more, and I’m the better for it. Push come to shove, I voted for Florence due to faithfulness and her bravery. Even though I have to admire Chad as maybe the first truly GREEN saint (you know that horses put a lot of CO2 out there), with the death of my father last week, I am definitely feeling the call of the “much beloved daughter”. Thanks for fleshing out the cloud of witnesses with these two wonderful his/her stories. Today we have two people who put God and the church above themselves! What wonderful examples and role models. It really is a “toss up” for me. I come down on the side of Florence because of her gender. Florence+ was a “first” – and under extrordinary circumstances. My children were baptized by a woman priest, and Episcopalians honor God’s 51% of humanity in having selected a woman as Presiding Bishop at a time where many parts of the Anglican Communion still wish to keep women “covering their hair”. My vote goes to Rev. Florence! Flo’s story is too powerful. But I admire Chad. I went with Chad. At a time when status within the Church meant one possessed considerable power, he remained humble. Chad could have held his ground and started a small war. Another very difficult choice! Although I did vote for Florence (earlier this morning before she was so far ahead) I think Chad set a wonderful example and would be sorry to see him lose by a lopsided margin. My problem is often deciding which voting crieria are most important. How much that saint’s life has affected me? That would give Luke a huge advantage. How well authenticated their story is? How much good they did for their contemporaries? Or how important an example they set for us today? Choices, choices! Two more awesome examples to follow, but I have to also go with the Flo today. I know I am going to start a controversy however, I voted for Chad as I have not decided if women should be priests. Yes that is correct!! I cannot deny that Sister Florence was a exception. However, I have seen few exceptions personally. I grown up in the so called feminist era and I found/find most if it a crock. I do not mind being in the losing camp today. oh Nancy, I wish you could have experienced the ministries of four especially gifted females priests I’ve been blessed to know! You would have seen, and had “certainty, and no doubt”* that they had answered God’s call to be who they are where they were! Last week I enjoyed a screening of ‘Pink Smoke Over The Vatican’ the story of the cause of women’s ordination in the RC church, and met Fr. Roy Bourgeois who was removed from priestly ministry for his support of the movement. I was the only female priest in a collar present, kinda wish more of my Episcopal colleagues were in attendance, but then again the event was competing with the road company of “Priscilla Queen of the Desert” which was playing across the street. I’m awed by the sense of call that Florence and Fr. Roy felt, one stepping aside from the practice of priesthood; one removed. Both responded to conscience and being true to their calls and their visions of the larger picture of Christian responsibility in a broken and unjust society. Florence gets my vote today. Thank you for mentioning this film. I looked Fr. Bourgeois up on Wikipedia because one of the pastors of my grandparents’ parish in Massachusetts was also a Father Bourgeois. I was wondering if he could be the same priest. He is not, but what an inspiring story of witness. Thank you for helping me learn about another contemporary saint, in the Anglican sense. St. Chad, for Catholic order. In response to suggestion in today’s Comments …how about a Lent Madness cross stitch pattern for the LM Store? Another Florence, I knew before I ever opened the website in which direction my vote would be cast. (I was named for my mother, who was named for her aunt, who was named for Florence Nightingale too.) Besides, Mother Li-Tim-Oi was present (and much honored) at the graduation of my youngest daughter from the General Seminary, so I was already an admirer. Glad to know more of the honorable and humble Chad too, though. All blessings, Flo! Humility seems to be quite the theme with both biographies today. It’s definitely my favorite virtue, meaning the one in which I am most deficient. Looks like Seabury won’t be the only blow out if trends continue. I voted for Florence since my church has a wonderful female rector, who could not have served without Florence Li Tim-Oi’s pioneering effort. I was all set to vote for Florence as the first Anglican woman to become a priest (having wanted to be one when I was 10 years old back in the late 50’s), but Chad’s humility won me over (in addition to his being so very far behind). But here’s a big shout-out for Mother Florence! I was glad to find out more about the first Anglican woman priest. Florence definitely has my vote. I would have voted for her anyway since she was located in Macau where my son was a missionary for two years. Macau really needs more like Florence since the casino industry has taken over the island. Soft spot for Florence because my grandparents were missionaries in China for 40 years, and were incarcerated by the Japanese for four years during the war. My grandmother nearly starved to death. The Chinese suffered even crueler fates at the hands of Japanese at that time. God bless her for a courageous ministry, and kudos to that Bishop, for breaking ground and ordaining her! Did you know that there was once a third Archbishopric in England? From ca. 787 until 803 Lichfield also had an archbishop — mainly for political reasons as Mercia (a separate kingdom then) didn’t like being dependent on a foreign primate — but still a bit of a plus for Chad. As a female priest, raised up from and serving in the Diocese of San Joaquin, I rejoice in the life of Florence, who serves as an icon for women’s ordination. That being said, I have a soft spot for Chad after visiting Lindisfarne (Holy Island) and Northumbria. Both are wonderful saints of God! My vote is for Florence. An extraordinary couple. The ancient and the modern, the then and now. I had never encountered either of these marvelous people–and their stories triggered all sorts of pictures/ideas–How rich we are. similar stories but different centuries. This was close for me but the story of the vestments being cut up with scissors clinched it. My vote went for Florence. What a gracious woman she was!
. . . and the Episcopal Church more priests like Florence Li Tim-Oi. Speaking of Bishops I’d like to urge people to buy Bishops Blend coffee from ERD as a way to give during Lent to others. It’s really great coffee and it helps these fair trade coffee growers to make a living. Just go to the Episcopal Relief and Development site and follow the links. So many women have served so well and have never been recognized either for their humble offering of self nor their saintly virtue; even more were never allowed to be ordained to both affirm their ministry and serve as a platform from which their service could further extend to the lives of the faithful. My vote is with Florence. I go with Flo–in part because of Niebuhr’s involvement. Back to my years growing up in the Riverside Church’s youth program, with Union Seminary students as our Sunday-School teachers…and thus Niebuhr’s influence strong! Florence+ would have had the sense to get on the darned horse! And although both were humble, Florence+ didn’t make a show of it! I think Chad took the whole humility thing too far. There’s something of Uriah Heep about him. Having recently visited Lindisfarne in Northumbria, walking in the steps of St. Aidan, and being a descendant of the fine folks in that area, I felt the urging to support Chad. But reading for the first time about Flo – my heart goes out to her. Imagine being the first woman ordained to the priesthood in the Anglican communion – an issue that still isn’t resolved! She served our church well, and gets my vote. I do believe Flo is a winner! What courage and love of God and mankind. She obviously had a good start from a father who named her with his love. When I worked at the Episcopal Church Center is 1983 I took on the task of gathering all the documents in the building pertaining to the struggle for women’s ordination as the news releases,letters and all the other ephemera were rapidly disappearing into shredders. In one file cabinet I came upon material regarding Tim-Oi. I was flabbergasted, 30 plus years before the Philadelphia 11, why had we never heard of her before? The night before Barbara Harris was consecrated Bishop there was a gathering in Cambridge, Barbara was there, Tim Oi and most of the Philadelphia 11 as well as many amazing lay and ordained women who worked tirelessly for women’s ordination and consecration. At some point I chatted with Tim-Oi and we traded business cards, I know my card has gone the way of all things, but I will treasure hers forever. This is so hard! I so wanted to vote for Chad both for his humility and for his Celtic origins, but Tim-Oi just called to me! I had the great privilege of meeting and interviewing Florence Li Tim-Oi at Lambeth 1988. This is the first match-up that’s been easy for me! These are, indeed, two inspiring saints. Chad, as patron of pedestrians, is a particular favorite of mine. We here in Asheville have experienced some horrific accidents as more people try to walk along streets originally designed only for car traffic. If St. Florence Li Tim-Oi walks all over St. Chad, as seems likely, then we invited Chad to spend the off-season here in North Carolina where brackets of all sorts and conditions have been conquered for years. While I am quite Celtish, in mind & appearance, & I find Chad so admirable, I had to vote for Flo! For some reason, I was not familiar with her and I am thankful she is in the brackets this year. Such an amazing woman, strong in faith, heeding the Lord’s call, willing to endure the dangers of the Chinese rule to serve Him. Obviously, humble, stepping down when male priests became available, not that she was not more than qualified. God bless Flo!! I feel kind of bad for St. Chad. It’s hard to beat someone who was arrested and punished with forced labor for the faith. Is Chad the only contender not even able to crack 1,000? Sheesh! Also, I notice folk still trying to protest by continuing to say “It’s not fair!” Is there some part of MADNESS that’s still unclear? The issue of “fair” is just not part of this whole kit and kaboodle! Lighten up! The worst is yet to come! Whoops! I mean better! Honest! I kid you not!